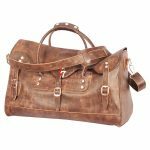 This luxury large holdall is designed especially for long trips away. it carry’s significant amount of luggage with ease. Due to long trips it has to be robust and durable so while it gets thrown around during the journey it doesn’t get damaged. This bag has been constructed on the basis of durability without compromising its style and finesse; it has three buckled leather straps for the main body and four flap pockets with buckles, two on the front, one on each side of the bag. 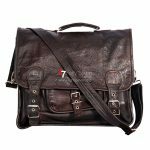 The bag has a carry handle with leather strap it also has an adjustable shoulder leather strap which can be removed if not needed.